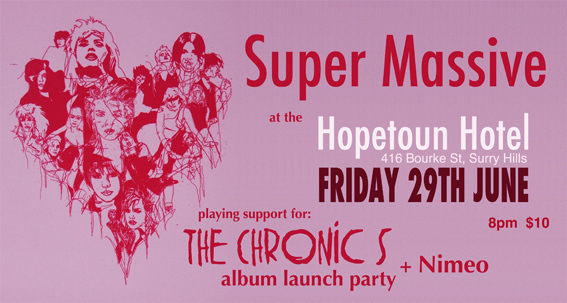 Super Massive build on their brilliant recent show at The Supper Club, Will & Toby‚Äôs Taylor Square, with a return to old fav The Hopetoun Hotel on Friday 29th June, to support The Chronics for the launch of their debut album ‚ÄúSwitch Me On‚Äù. The Chronics write a catchy tune, and first single ‚ÄúOn Account Of My Lover‚Äù has already been added to high rotation on Fbi. Super Massive are also purveyors of catchy tunes, delivered in a heady brew of tasty playing, exhilarating grooves, gorgeous creative layers of synth sounds, and loads of rock-fuelled stage presence. A fun, raucous night! Don‚Äôt turn up late, as it may be a squeeze.. Doors open 8pm. $10- Local band Nimeo support.